Several hundred people gathered outside the building of the Verkhovna Rada of Ukraine to voice their political demands to the deputies. 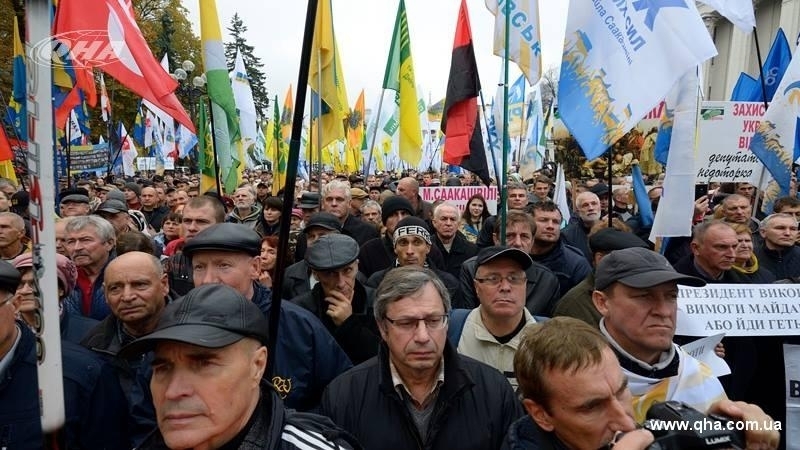 Reference: October 17, a mass meeting began outside the building of Ukrainian parliament. The protesters demand the adoption of new rules for elections to the Verkhovna Rada, which would provide for a proportional system with open lists, as well as the abolition of parliamentary immunity and the creation of an Anti-Corruption Court. At the rally former Georgian President Mikheil Saakashvili advised the President of Ukraine Petro Poroshenko to resign. Later, the Prosecutor General of Ukraine Yuriy Lutsenko promised to provide evidence that activists outside the Verkhovna Rada are being financed from abroad.